When it comes to needing business cards in Nottingham, be sure to shop online with CRS Graphics. We offer an efficient and low-cost business card printing service, where we can create personalised business cards that fully meet your requirements. No matter how few or many you need, you can count on CRS Graphics to provide you with them. At CRS Graphics, we are able to work with existing artwork to create business cards or we will happily create a design for you. Our printed business cards offer a number of customisation options, meaning you have the ability to create the perfect business cards for your needs. We pride ourselves on offering professional business card printing to customers throughout Nottingham and the surroundings areas. But we don’t stop there, customers across the country are welcome to use our business card printing, as we offer nationwide delivery. 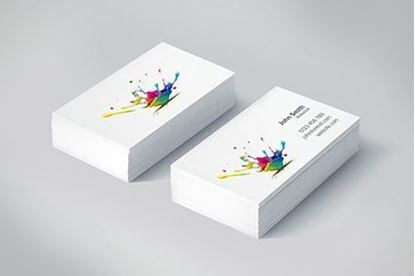 All of our business card printing is carried out using quality inks and materials to ensure a high standard of finish. Business cards are one of the best and most effective ways to connect with local customers and they can also encourage return business. It’s important for business cards to be personalised with your brandings and company information so people can easily recognise your business and get in touch with you. We offer high quality printed business cards to ensure your business stands out from the crowd. If you’re in need of business cards in Nottingham, then be sure to order them from CRS Graphics. Orders can be placed directly through our site or alternatively you can call us on 0115 940 0051 to place an order. We offer both mono and full colour business cards, which are both available in single or double sided options.